Somehow LA became on of the places I’ve visited most often during the past two years and I’m quite happy about it. 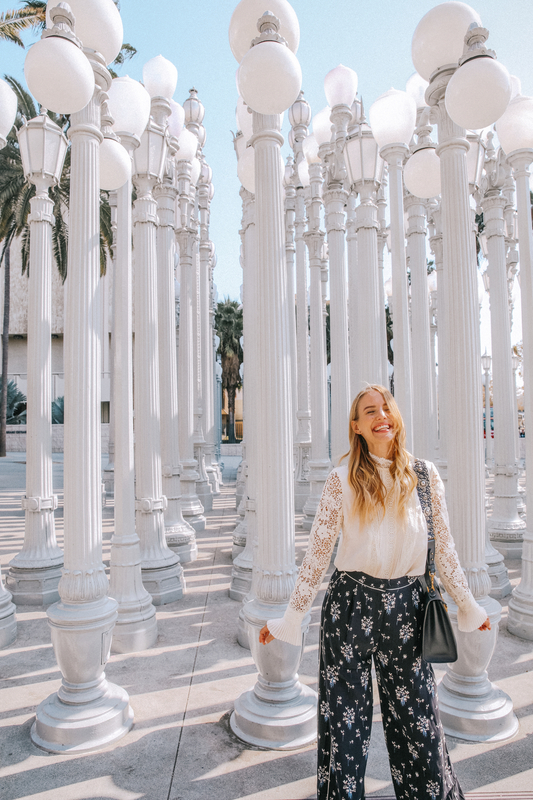 With every visit I spend more time with my LA friends, revisit my favorite food places and feel more and more like home so far away from home. 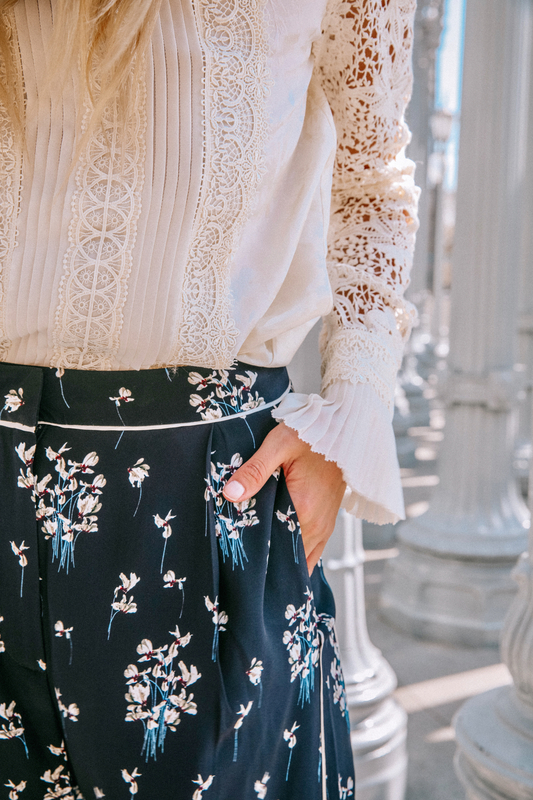 This time I’m visiting LA for the launch of the new #ERDEMxHM collection. Ever since the first designer collaboration of H&M I’ve been a big fan. I used to take a day off at work to be early at the selected stores and every season I can’t wait to discover with whom H&M is partnering up. 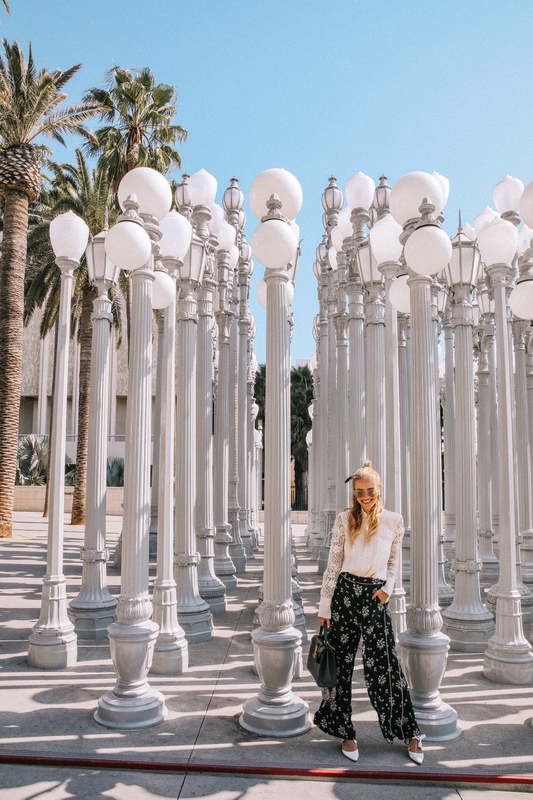 Before heading to LA I was invited by H&M to get a sneak peak of the collection and I was even allowed to take a few pieces with me even before they hit the runway in LA. 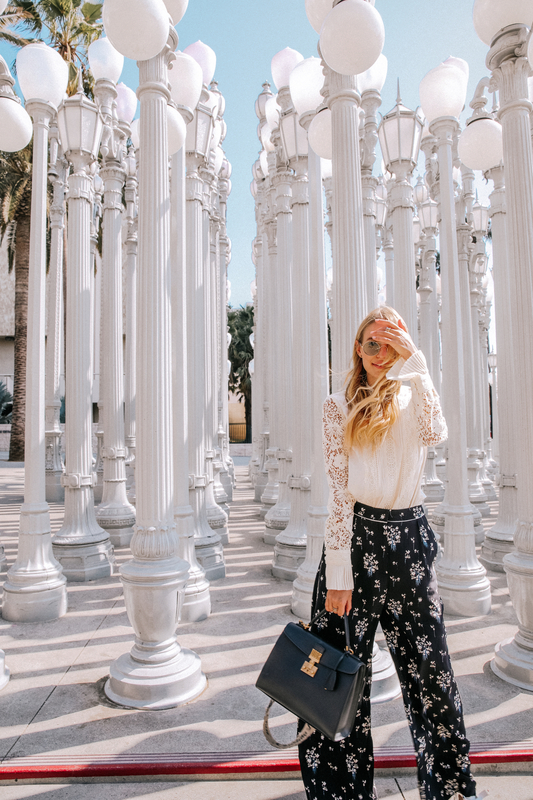 Yesterday before the show I headed to one of my favorite places in LA, LACMA, to shoot two of my favorite pieces of the ERDEM for HM collection: Floral PJ pants and a beautiful lace blouse. I combined them with my white Proenza Schouler heels, my new dream bag by Dior (I just bought it one week ago and I’m wearing it 24/7 ever since) and my new Linda Farrow sunnies. Nice look! I love the pants! Oh wow der Look ist so super schön. Vor allem in die Bluse mit den tollen Details habe ich mich sofort sowas von verliebt! Love Erdem & so excited that he partnered with H&M! How fun! I love going up to L.A. Die Bluse ist zuckersüß! Steht dir ausgezeichnet! So I LOVE Erdem and I was so sad that I didn’t’ get my hands on this collection. I had to miss the preview as well 🙁 You look gorgeous and I really love how you styled the pieces – very true to your personal style!! Na toll, jetzt wo ich die Bluse bei dir sehe wünschte ich ich hätte sie mir bestellt…. 😀 Online hat sie mich nicht so angesprochen, aber jetzt bei dir? Ein Traum!!! 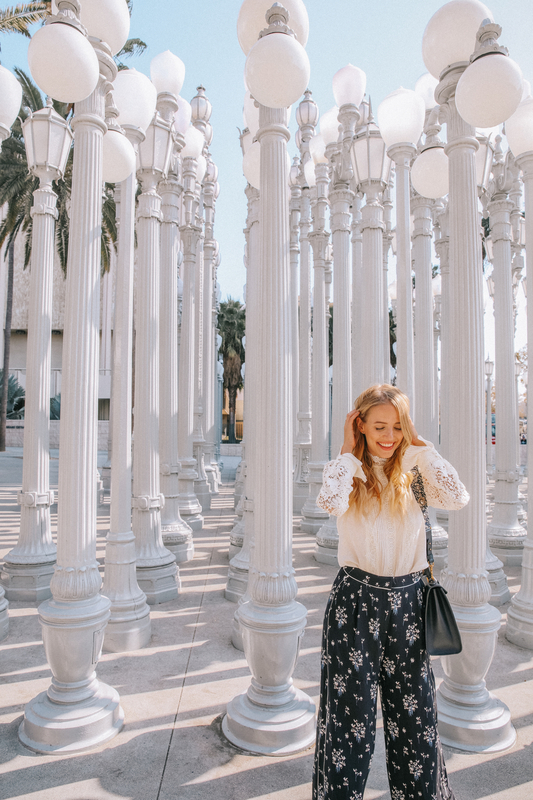 I just love that location and your whole look! I think out of all the H&M designer collabs, this one is my fave! 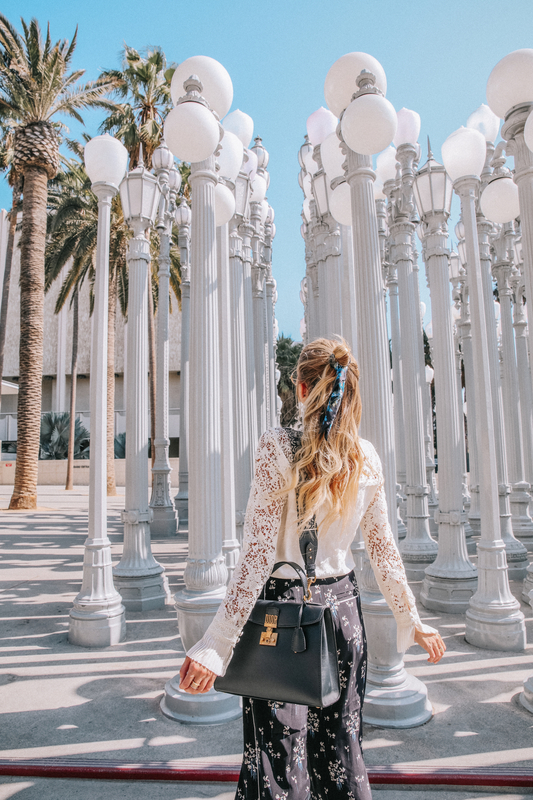 Tolle Tasche zum tollen Outfit. Mega schön wie Du den Look kombiniert hast! Mir gefallen besonders die Hosen total gut! Die Kollektion ist allgemein super gelungen!